any minute for the take. Brightly colored all-wool pennant. to New York City for the finals? Will he be the new champ? full color illustrations from the film . Hard cover. 146 pages. Peanuts cartoons. 5'h x81.4 in. 228 pages. Shpg. wt. 12 oz. tree. 52 pages. 12xl7 inches. fantasies. By Charles M . Schulz. 254 pages. 8'h xll1.4 inches. The things that express the real "you". 3 N 1612- Bleah! vorites with you everywhere. Just 3'h x53/i inches. Linus, and all their pals, in black-and-white cartoons. 5'4x8 in. 128 pgs. Paperbound. Wonderful keepsakes. Sets of Six Books. Ea. 128 pgs. 4 \4x7 in. This is Your Life, Charlie Brown. Snoopy and His Sopwith Camel. 68 pages. 5'hx8 Ys in. Snoopy and the Red Baron. 5Ysx8 1.4 in. 64 pages. The Parables of Peanuts. By Robert Short. 328 pages. 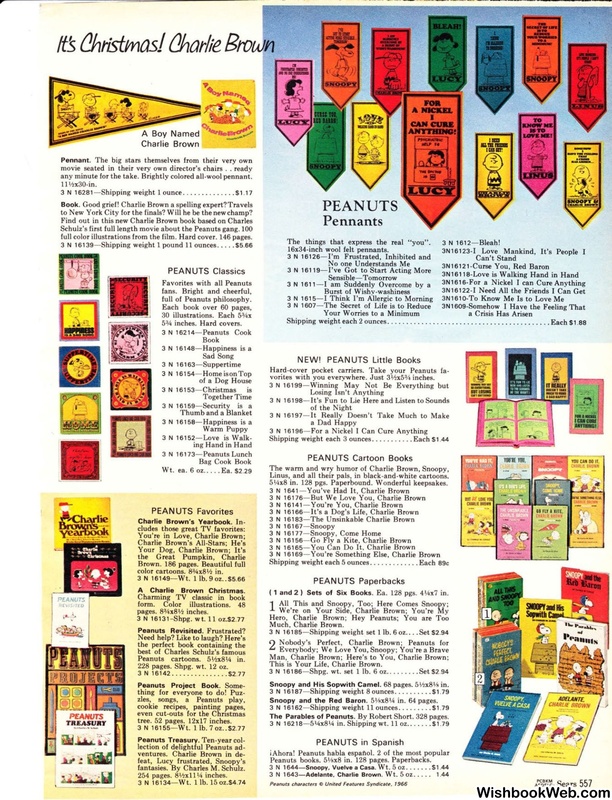 Peanuts books. 5Ysx8 in. 128 pages. Paperbacks.